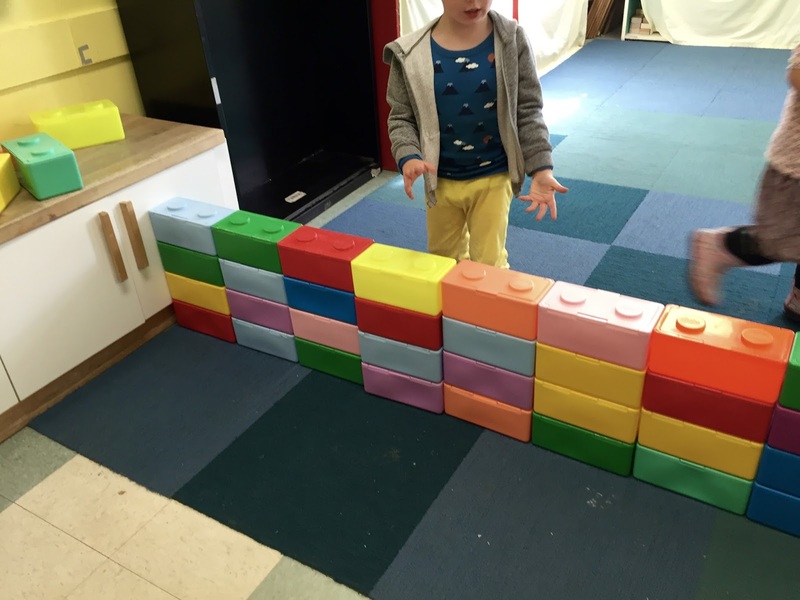 The two of them, a boy and a girl, built a wall. They had the entire checker board rug to themselves, they had all the baby wipe box blocks to themselves, and they decided together to build a wall to, in their words, "keep the others out." The goal was to build it so high that "no one could get over" and for quite some time no one even tried. 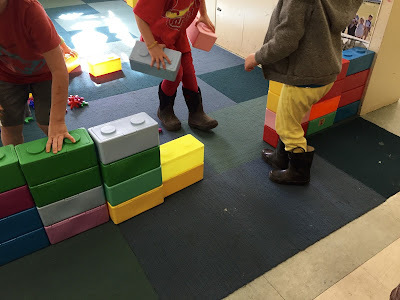 They used all the blocks and had all that space. 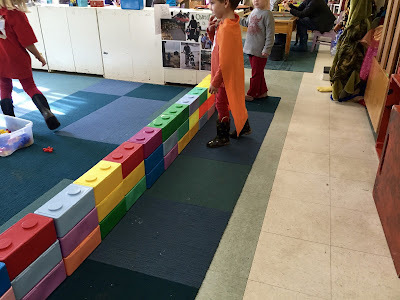 A classmate finally came to examine the wall. "It's a wall to keep people out," they said, "You can step over it and come in." When that first friend accidentally kicked part of the wall down in the process, they decided they needed a door. More friends joined them, using the door in the wall built to keep the others out. Soon there were a half dozen of them inside the wall. Someone said, "This is our new play area." 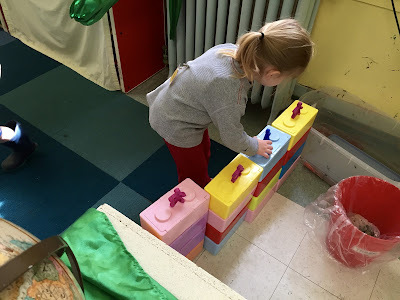 There were no other toys in the walled play area and the blocks were all incorporated into the wall. 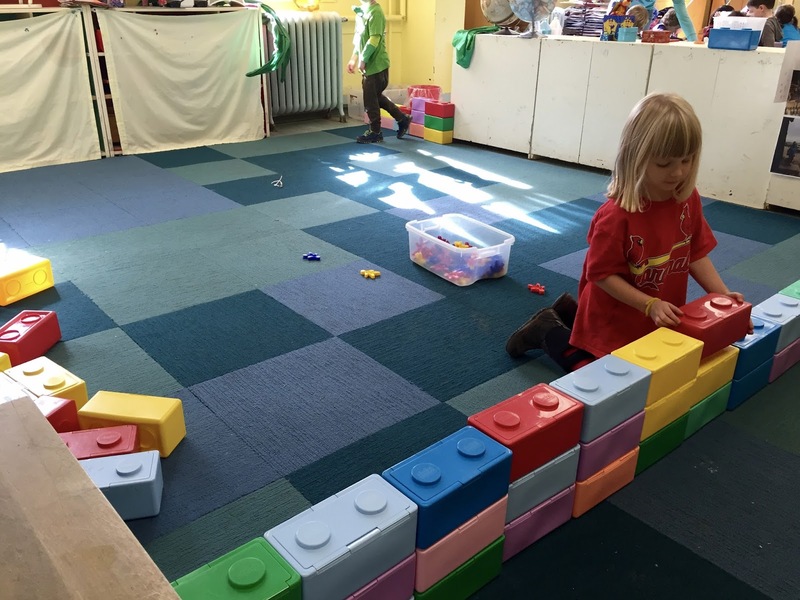 All they had was one another, the checker board rug and that wall that was not really keeping anyone out. They decided to make it a place for dancing. I put on some West African marimba music. 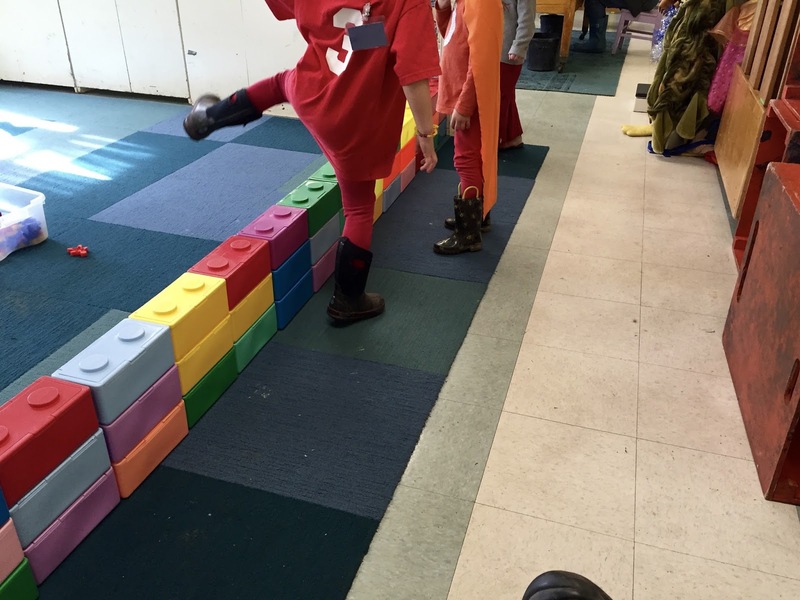 They danced within the wall in their own spaces and in their own styles. 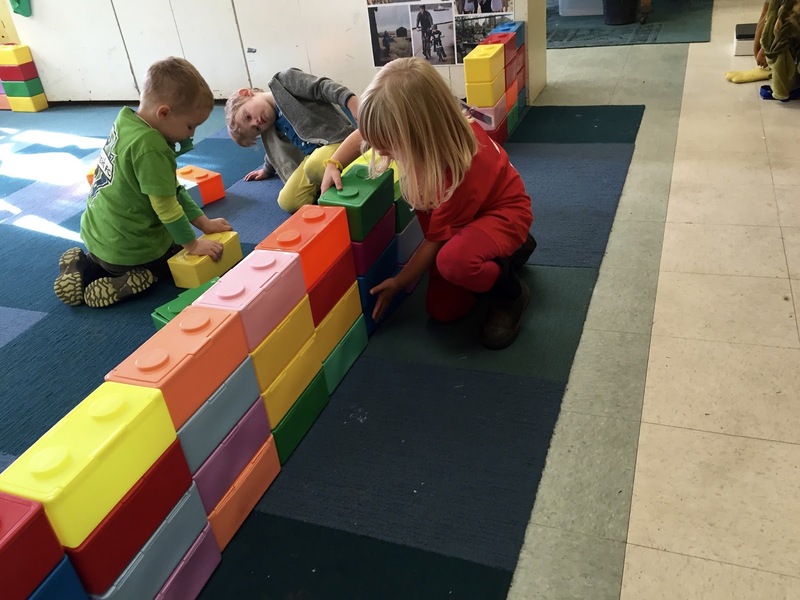 One boy found a box full of small, plastic rainbow people and brought it inside the wall. 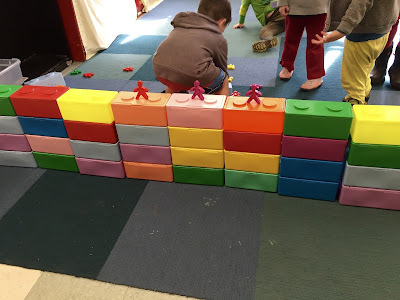 He began arranging them along the top of the wall saying, "These people are our audience." Some of the kids helped him arrange the rainbow audience while the others danced. 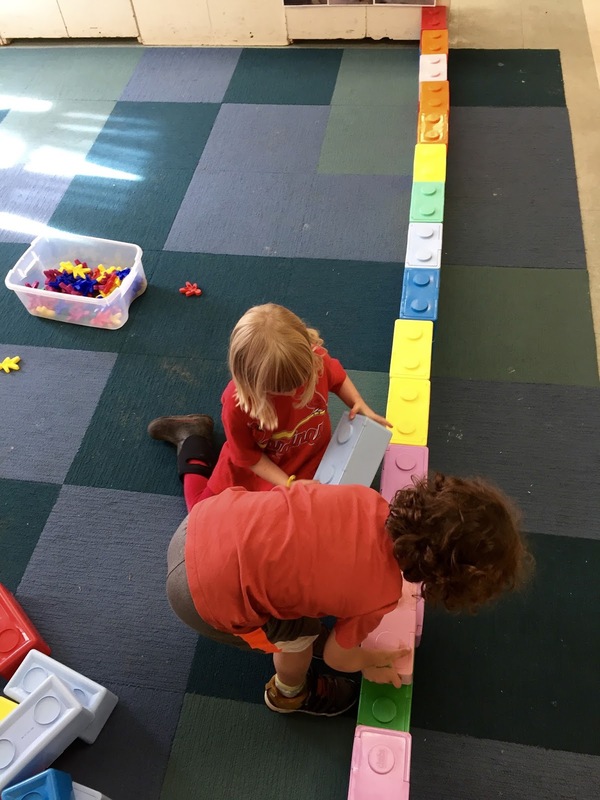 As is usually the case with four and five year olds, it isn't enough to play together without also touching one another. 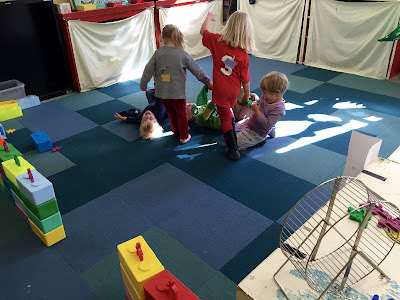 The dancers danced together until it evolved into a kind of pig pile under which one of them was trapped. She didn't cry, but they saw pain in her face and decided to play more gently. Amazingly, after a good 45 minutes, the wall with it's precariously balanced rainbow audience was still standing. By now there was at least a dozen kids inside the wall that had been built to keep the others out, the wall in which they had built a door, a wall inside which they had danced and grappled and empathized and compromised. Then, as is every wall's destiny, they kicked it over with such an eruptive suddenness that it alarmed us all. 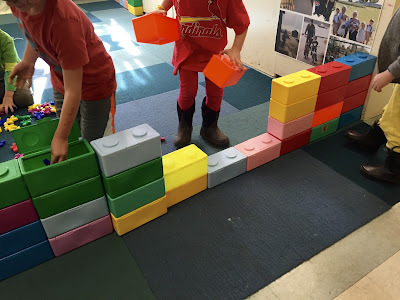 I had walked away just prior to that moment and returned, worried that they would somehow need big, responsible, adult me in the aftermath of that wall coming down, but I saw only smiles on beet red faces as they made rubble of that wall that could no longer even pretend to keep anyone out. 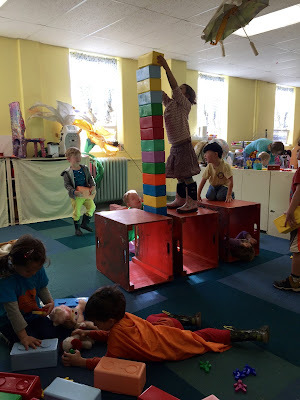 Moments later a cry went up, "Let's build a tower!" And together they did.